Creating a space with a multiple of uses is never an easy task. Communicating the architects’ solutions to the brief not only to clients but also to those creating the actual buildings is one of SketchUp’s many advantages, as this project for a Victoria school demonstrates. For LAW Architects in Melbourne, its design for Viewbank College’s Performing Arts Centre and STEAM Precinct would have been an even more formidable project without SketchUp. Not only that, but the program’s use-friendliness meant they could create their own plug-ins to get the job done and set standards for best practice. The Performing Arts Centre, when completed, will be a two-storey facility comprising of a flexible auditorium and theatre staging, including back of house technical, storage and handling facilities, front-of house gathering and foyer spaces and associated drama and music learning spaces. The program includes additional general learning classrooms and a purpose built Materials Technology facility as part of the college’s broader learning and curriculum strategy. A new canopy will provide a weather-protected link with the refurbished adjoining two storey building to create a STEAM learning precinct. SketchUp was employed by LAW Architects from day one of the project, including being used to assess where best in the landscape the buildings would work. The team built up basic ‘blocks’ to help convey the design in its environment. These were shared with the stakeholders and the siting was agreed on, moving the project to the next stage of architectural concepts. “The design solution for this project led to a complex arrangement of flexible spaces which would have been challenging to communicate without the use of SketchUp,” said senior architect and design consultant Barde Gregory. “With complex projects such as this, the model is organised and constructed in parts as separate SketchUp files. “SketchUp is used through the design sequence, from concept through to detail design. The team developed the Cross Reference Organiser plugin to allow each team member to progress their design in their model space while importing other team members’ parts as Cross Referenced components. A key element of the tool’s functionality is that it prevents a re-importation and superposition of many instances of each project part when team members are importing the contents of each others’ model space – no-one can over-write someone else’s work. The parts are worked on and then subsequently assembled into a master model file, reflecting a construction-like hierarchy, which is supported by a layer naming method, for instance: 1.Context, 2.Site, 3.Structure, 4.Enclosure, 5.Interior, etc. Segregation of the model enables not only teams working within the office environment, but potentially with other design disciplines. For example, the sub-contractor’s structural steel model was used for review against the SketchUp model for conformance to design intent, and also to identify structural clashes. 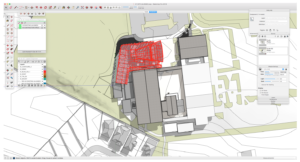 SketchUp has also given LAW Architects, on this job and others, a high-level diagnostic tool, allowing adjustments more easily, for example, on this project, it easily allowed the team to identify if the building had enough room for its uses. As well, the ability to create videos means conveying the building to clients and other parties is much easier and more effective, as the clip accompanying this article demonstrates. 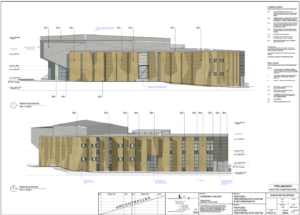 “Without SketchUp, all aspects of the design and creation of this quite complex building would have been considerably more difficult to achieve and communicate,” Barde said. BuildingPoint is the expert in design, build and operate. Contact us to find out how we can help your practice as Australia’s authorised distributor of SketchUp.